“Another big plus is letting interns apply for patents under their own name,” a puff piece about Adobe says, as if it’s a dream come true to be granted a patent. This, to us, demonstrates a profound issue. Patents as trophies. “Thankfully, a solution is coming slowly, albeit not without resistance from the meta-industry which is patent law firms…”“Access And Benefit Sharing” are right there in the headline. Remember the days when the patent system (well, so we’re told!) was there to help inventors preserve/disseminate knowledge rather than sue or shake down others? Those days are long gone as a predatory meta-industry now steers public policies and wants everything patented. They’re producing virtually nothing (patent law firms), just like patent trolls. Legal papers, litigation, billing etc. are not production but burdensome bureaucracy and lawyer elitism. How did we get here and how do we get out of this trap? How do we return to a world where it’s possible to code in peace, without fearing litigation over lines of code which were never copied/plagiarised but merely accomplish something similar to some words on hundreds of thousands of US patents on software? As a reminder to readers, PTAB is the board which is responsible for getting rid of software patents faster than even courts do (as for the USPTO, it’s busy trying to maximise income by granting almost everything). “A USPTO report,” says the above, “released in May revealed only 5% of motions to amend reviewed by the Board had been granted or granted in part – six of 118. A total of 192 motions to amend had been filed up to that point. A seventh motion to amend has since been granted, to ContentGuard in July. Well, the USPTO sure seems to be more transparent than the EPO under Battistelli, but there’s still a long way to go (see the USPTO documents we showed here last night). According to this new article from Patently-O, the USPTO has plenty to hide, including “Billing Fraud at the USPTO” (the EPO too, allegedly, has similar fraud) and “Examiner Time and Attendance Abuses”. To quote Patently-O, a “substantial number of patent examiners are involved in “time and attendance abuse” — working unsubstantiated hours” (so much for integrity of staff). 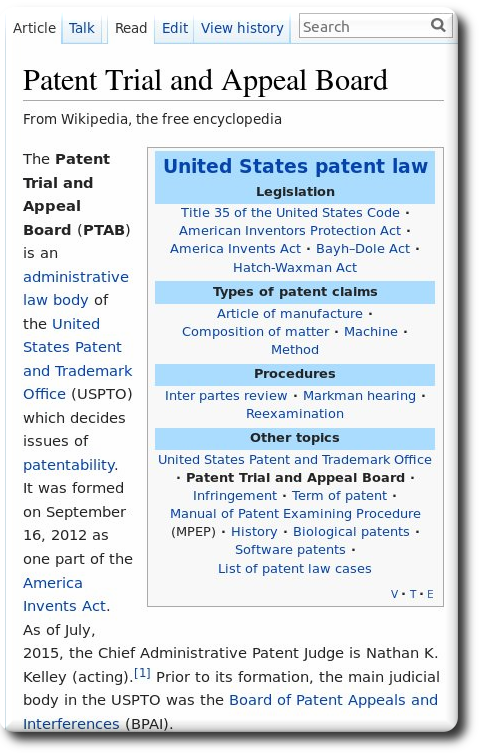 We sure hope that more people recognise the importance of PTAB’s function. It has made enemies inside the patent microcosm because those suffering from PTAB are some of the biggest parasites out there. Unlike staff at the USPTO, PTAB staff isn’t compelled to grant if in doubt. Staff isn’t assessed by misguided Battistellite criteria. The U.S. Government has waived its sovereign immunity against allegations of patent infringement. However, the infringement charges are not brought via Civil Action under the infringement definition of 35 U.S.C. 271. Rather, 28 U.S.C. § 1498 spells out that the infringement claim against the U.S. must be brought in the Court of Federal Claims (CFC) and that the remedy is limited to the “reasonable and entire compensation for [the Govt’s] use and manufacture.” The CFC does not allow for a jury nor will it award injunctive relief against the U.S.
Liberty sued the U.S. alleging that the ammunition rounds manufactured for and used by the Army are covered by Liberty’s U.S. Patent No. 7,748,325. In the 1990s and 2000s, the U.S. military became concerned that lead-based ammunition might be a form of harmful pollution – the patented ammunition here follows that lead by eliminating lead from the round while remaining lethal to soft-tissue targets (such as humans). According to the patent, the projectile (shown in the image above) separates into three portions upon striking a target. The projectile also includes a reduced-size jacket that limits barrel heat build-up. If patents are a government-enforced monopoly which the government itself is exempted from (no liability), then no wonder the perception of justice is so elusive. Unless the patent system can revert back to sanity, where promotion of science and technology (or “innovation” as today’s buzzword of choice) is paramount, people won’t be happy and they will perpetually demand change.